The regional Brexit impact assessment figures that the Tory government were trying to hide have been leaked, and they spell disaster, especially for the North East, North West, West Midlands, and Northern Ireland. The Brexit assessment looked at the regional impact of three different Brexit scenarios, a Single Market Brexit, a free trade deal, and a "no deal" reversion to World Trade Organisation rules. 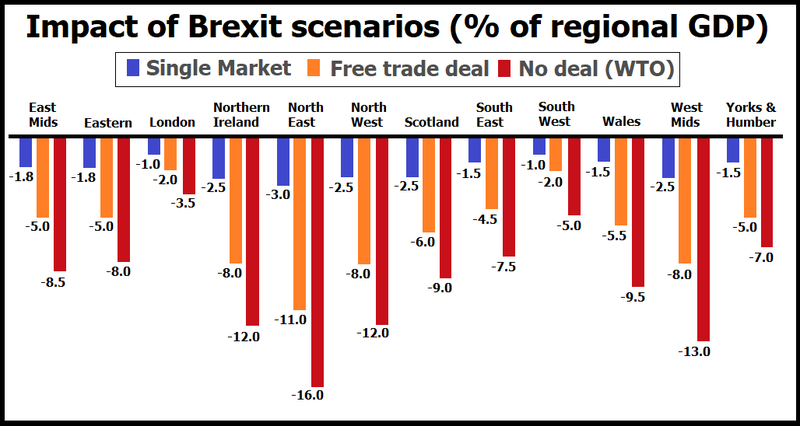 In every single region it turns out that "no deal" is by far the most damaging option, ranging from a 3.5% fall in the London economy to an astounding 16% collapse in the North East. The analysis suggests that aside from London and the South West, a "no deal" Brexit would trigger a financial collapse that is worse than the recession that followed the bankers' insolvency crisis. The terrifying thing is that as a result of ruinous Tory austerity dogma and their unprecedented campaign of wage repression the UK still hasn't recovered from the last recession, yet the Brextremist faction of the Tory party are pushing for a "no deal" Brexit which would hit us with another, even worse recession. The second worst scenario is a free trade deal Brexit, which would still see significant economic contraction across every single region. The least bad option is the Single Market option which would cause a slump of between 1% in London, to 3% in the North East. It's important to recognise that the least bad Single Market scenario is off the table as long as Theresa May and the Tories are running the negotiations for their own purposes, because they have continually ruled it out. One of the standout things about the analysis is the way London is projected to suffer the least under every Brexit scenario, yet London voted heavily in favour of Remain, whilst some of the strongest Leave-voting areas like the North East look set to suffer the most extreme economic downturns from the Brexit they voted for. This contrast certainly adds some more statistical weight to the Turkeys voting for Christmas narrative. 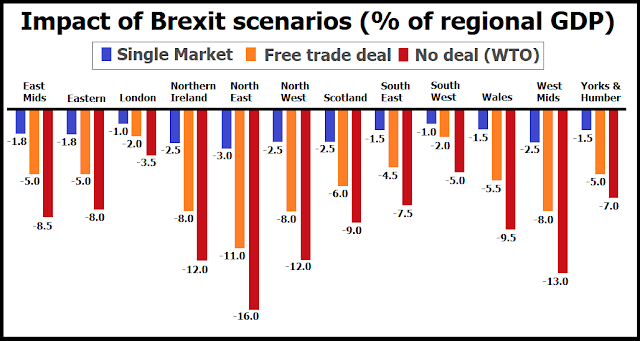 However it's not all totally clear-cut, because Wales and Scotland look set to suffer very similar levels of economic damage as a result of Brexit, despite Wales voting in favour of Brexit and Scotland voting very heavily against it. Anyhow, the reason the Tories wanted to keep this analysis secret is beyond obvious. There's no way they can pretend that there's any economic benefit to Brexit now that their own evidence says that it would cause an economic downturn/recession in every single part of the UK. Another reason they must have been desperate to keep this research under wraps is that it completely destroys their endlessly repeated propaganda trope that "no deal is better than a bad deal". Their own evidence demonstrates beyond doubt that "no deal" is the worst possible deal, so they'll surely have to bin that appalling nonsense for good after this. And no, blue passports (that we could have had anyway without quitting the EU) just won't cut it. * = If I were to give advice on how to achieve such a change of approach I'd suggest that politely pointing to the facts and evidence to request a change of Labour Party policy in order to "protect jobs and the economy" is more likely to succeed than a relentless barrage of #FBPE abuse, revisionism, misrepresentations, and lies from Lib-Dems, Tory concern trolls, and the very same people who were shrieking anti-Corbyn nonsense during the spectacularly failed chicken coup of 2016.